Fellows will convene for a three-day intensive workshop at Yale University where they will present and engage with each other’s work. They will meet with and receive feedback from the workshop’s two faculty mentors, Professors Kathryn Lofton and Linn Tonstad. Following the three-day workshop, fellows will stay in New Haven for an additional two days to write and to take advantage of Yale University libraries and resources. Selected fellows will receive small stipends and travel funding in addition to room and board for the week of the workshop. Application deadline is Friday, February 15, 2019. 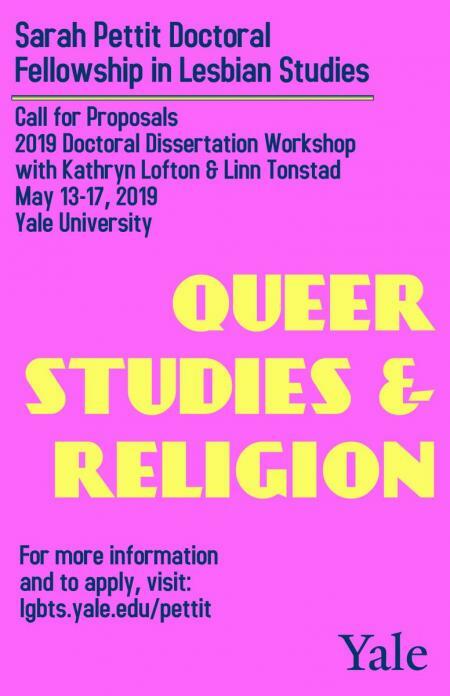 We welcome applicants from the humanities, social sciences, performing and fine arts, and beyond, to share their emerging scholarship on queer studies and religion. We are interested in applicants who will teach this gathered community about the disciplinary limits they perceive through their research and how they supersede those limits (or are constrained by those methods). We have no central object that organizes us other than the hope to discover, through conversation and critical reading, sharper arguments for our shared scholarship. Within the frame of queer and feminist studies, a great deal of incisive scholarship has suggested the value of ambivalence as an analytic entryway to the conflicted modes of queer political, affective, and conceptual survival. Within religious and theological studies scholars have repeatedly, perhaps excessively, returned to complexity as a concluding term of historical, sociological, or theoretical valuation. We are excited to imagine interpretations beyond complicated ambivalence. How do we author scholarship at the intersection of queer studies, lesbian studies, and religious studies that does not summarize states of multiplicity but also argues for interpretive clarity? What would queer feminist criticism in the study of religion produce? What can the study of religion offer queer feminist critics? During the workshop we imagine discussing particular features of fellows’ scholarship as well as the factors (social, economic, and ideological) influencing the production of scholarship in the present time. Applicants must be enrolled doctoral candidates who have completed coursework, qualifying exams, and submitted their dissertation prospectus (i.e., ABD status). Students studying or located in all geographical regions are welcome. However, funds from the Pettit Fellowship may not be able to cover the total cost of travel for many students coming from international locations. We encourage students from non-US locations to apply for supplementary travel funding from their home institutions. Doctoral students enrolled at Yale University are ineligible to apply for the Fellowship. Students working on projects concerned with a range of genders, gender identities, sexualities, and sexual practices are invited to apply. We seek applicants who can engage scholarship outside their specializations and who are interested to consider the broad consequences of different methods and approaches for scholarly work. From 2006 to 2014, the Sarah Pettit Fellowship was run as a biennial fellowship providing a year of support to a graduate student, from an institution other than Yale, who was writing a dissertation in LGBT Studies, with lesbian studies as its focus. From 2016 onwards, the format changed to a biennial dissertation-writing workshop for scholars working on select themes in lesbian studies. We expect notifications to go out by mid-March 2019.